GYCC has an active ladies section. They have arranged Ladies only rides and have some great plans to extend and enhance that in 2016. Well ladies, we are now rolling out of a pretty good summer and into autumn, it has gone so quickly I did not get round to a summer update. So what have we achieved throughout the summer? 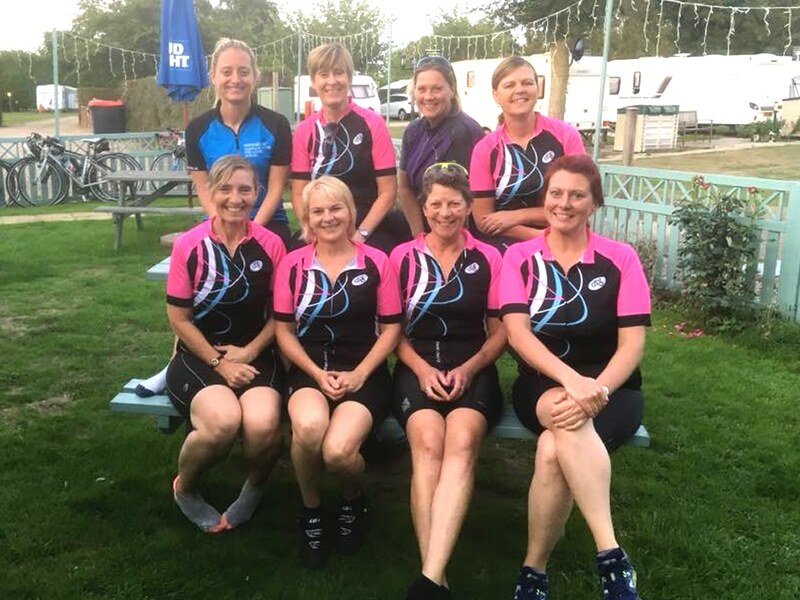 We started a beginner’s road bike ride on Wednesday evenings for the ladies, the aim was to help, encourage and give some coaching tips on riding a road bike, gears, hills and group riding, and generally enjoy a very pleasant easy ride around the country roads of Somerleyton area. It has been very successful and, with the help of Jan, we started off with one lady and have now built up a small group who enjoy our evening rides. They have all improved their cycling skills, gained confidence and some now join in the Saturday morning club rides. We have had a few coffee and cake rides as well, and plan to do more. We hope to continue through the winter probably alternate Saturdays weather permitting, or possibly combine with the club Saturday ride which goes from Pedal Revolution in Gorleston. We will keep you informed via FB, messenger. Jan and myself have been busy at Time Trials, this takes up a lot of time especially at weekends so we do not get out on the Sunday club runs very often. We both rode in the Tour of Cambridgeshire in June, on the Saturday 26K time trial, Jan was 12th in her age group, I came 2nd in mine and a place on the podium. It was an amazing experience, just like you see with the professionals. There was a big club presence on the Tour of Cambridgeshire sportive on the Sunday with a good number of ladies from the club riding. Jan has done some excellent rides and got PBs at 10, 25 and 50 mile distances on both the Bungay and Somerleyton courses. Well done Jan, so proud of you. Jackie and myself set off in July to conquer Land’s End to John O’Groats on a trip organised by Peak Tours, they run lots of various cycling trips in this country and abroad. I managed to fall off and crack my wrist on the first day, tried to continue but it was not safe really and ended up coming home, leaving Jackie to continue. I followed Jackie every day on her adventure, upset that I was not there with her, the scenery looked fantastic, I knew she was with good company cycling with a small group of 4 others. Jackie was amazing and finished the trip all in one piece, even though she did come off on the second day and took all the skin off her forearm near the elbow, ‘ouch’. There were 24 riders in total, all riding at different paces so you find yourself linking up with people riding at the same pace as yourself. This is great because you help and encourage each other along, you arrive at the brew and lunch stops together, often arriving just as the faster riders are then setting off again. Everyone on the trip was very friendly and we all got on well. Well done Jackie, so proud of your achievement. I will be doing it next year with Jan, fancy it again Jackie? Or any other ladies? 3 Billie Fleming tribute rides. Who was Billie Fleming and what did she do? In 1938 Billie Fleming rode every day of the year and covered almost 29,603.7 miles on her bike, a Rudge-Whitworth cycle, which is an amazing achievement. Billie got the cycling bug and she took every opportunity to get out on her bike. In the 1930s Mary Bagot Stack had created the Women’s League of Health & Beauty, and her vision was of “a league of women who will renew their energy in themselves and for themselves day by day”. Billie subscribed to this concept and firmly believed that you could keep fit by riding a bike, so she set out to prove it by riding a bike every day of the year. This was not to be an endurance ride but was simply a demonstration of Billie’s belief that cycling keeps you fit. So passionately did she believe in this that she gave up a senior typist job to carry out this challenge and wrote to a number of companies to get sponsorship. Sadly, Billie passed away on 12th May 2014 aged 100, her family decided to set up a website and plan to get us girls on our bikes and ride the routes that Billie herself rode in 1938. All over the country groups of girls and individuals rode the routes Billie took covering thousands of miles and having some great rides with lovely company, good coffee and cake stops (essential part of social riding). The rides we done were on 27th June, started at Somerleyton, rode to Bungay, Southwold for lunch and on to Gt Yarmouth where Billie finished her ride. We covered almost 60 miles and had a great day. Our 3rd ride was on 22nd November, again picked our own route, we had planned a long ride, but the weather made us cut the ride short, we got to Loddon and there was about 2 inches of snow, we decided to cut across country the shortest route to Earsham Hall tea rooms, coffee, hot chocolate and warm scones which had just come out of the oven, oh they were good. We made our way home via Ellingham Mill again, one of my favourite routes, 45 miles. Throughout the year we also done training rides together, club rides with the guys, some of us like to time trial, others just prefer to ride with us socially, which is a really nice way to get into cycling. I am planning for this year now and will be posting further information in due course on social evening rides for us girls to help and encourage you girls who really want to get into cycling but think they will not be able to keep up. Don’t worry if you do not have a road bike we will have a few which the club will loan for you to try. You will as we will keep together and look after everyone, you will build your confidence and fitness and have fun, meet like-minded girls and have new friends.